Back in summer of 2010, the inaugural Despicable Me animated movie took the blockbuster season by storm. 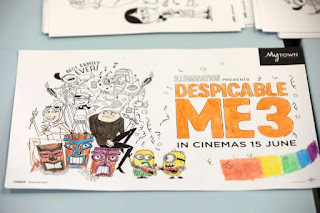 Not based on any fairy tales nor a sequel from a successful franchise, Despicable Me's original story with compelling characters and comedy appealing to both kids and adults held its ground against box office giants like Toy Story 3 and Shrek Forever After that same year. 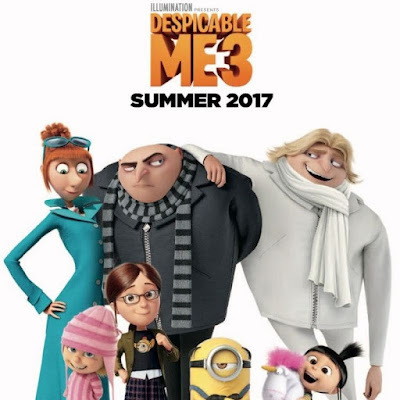 Raking in over USD543 million worldwide, Despicable Me screamed for a sequel spawning Universal Pictures' most profitable franchise. 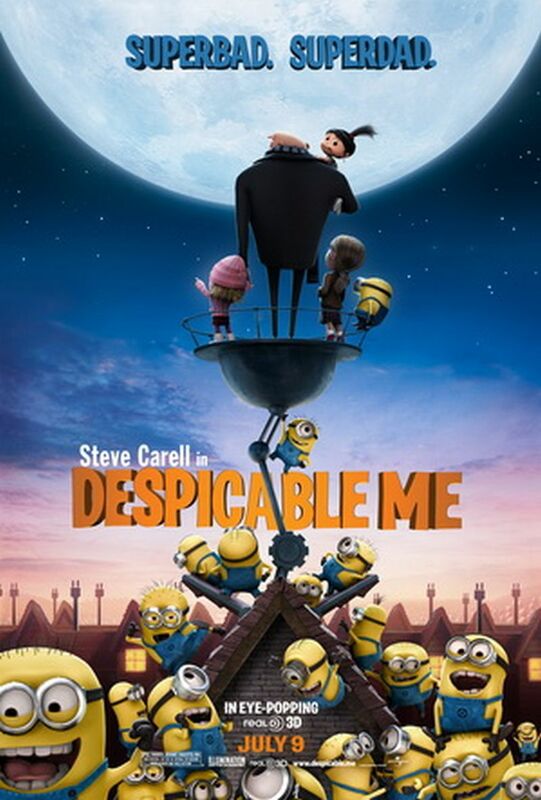 Despicable Me (2010): $543 million. That sequel simply titled Descpicable Me 2 released 3 years later in 2013 to satiate fans with a box office of over USD970 million. 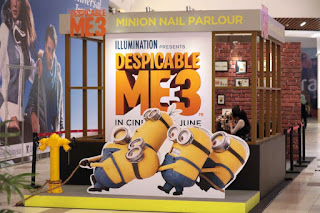 In between the 2 movies, Universal Studios Florida opened the Despicable Me Minion Mayhem theme park attraction in 2012. This attraction has since extended to Universal Studios Hollywood in 2014 and Japan in 2017. Perhaps Universal Studios Singapore would be next? 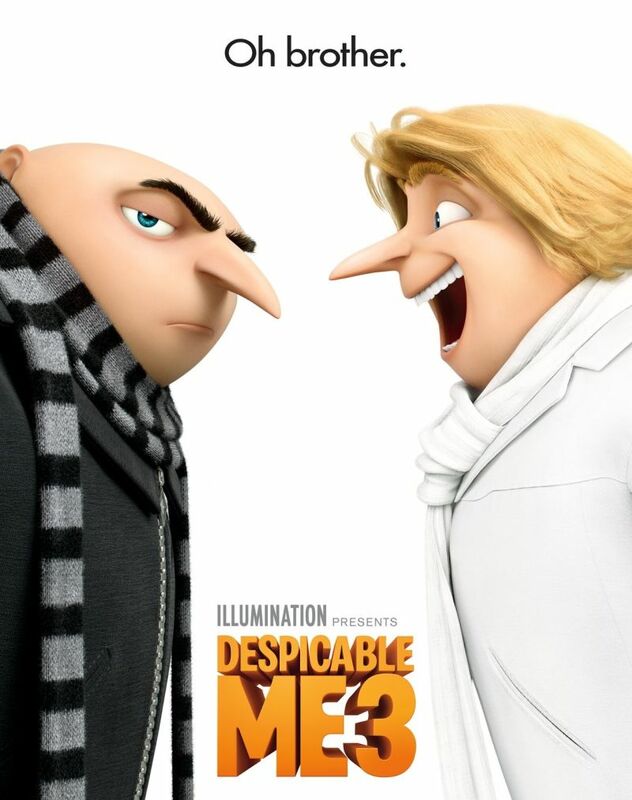 Despicable Me 2 (2013): $970 million. 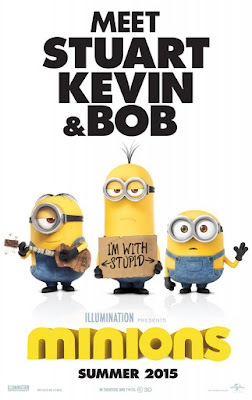 Universal Pictures and Illumination Entertainment recognised that their Minion characters were part of the success of the franchise. 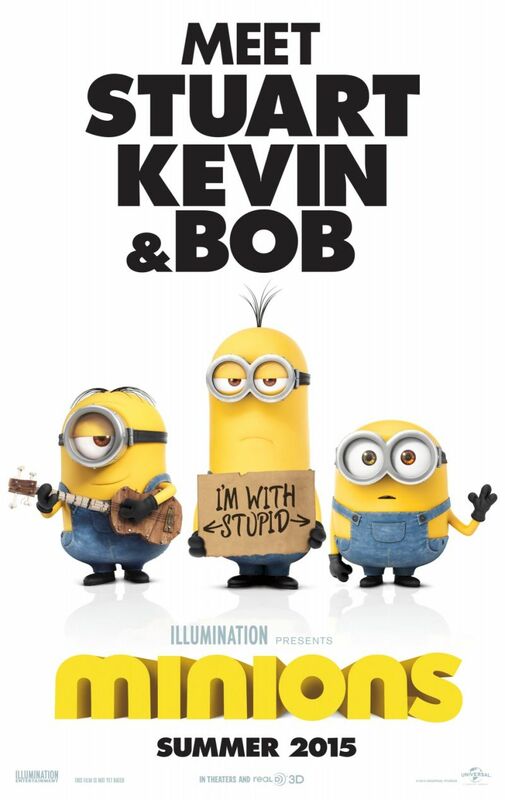 So in 2015 they released a Minions movie just for the lovable yellow creatures. 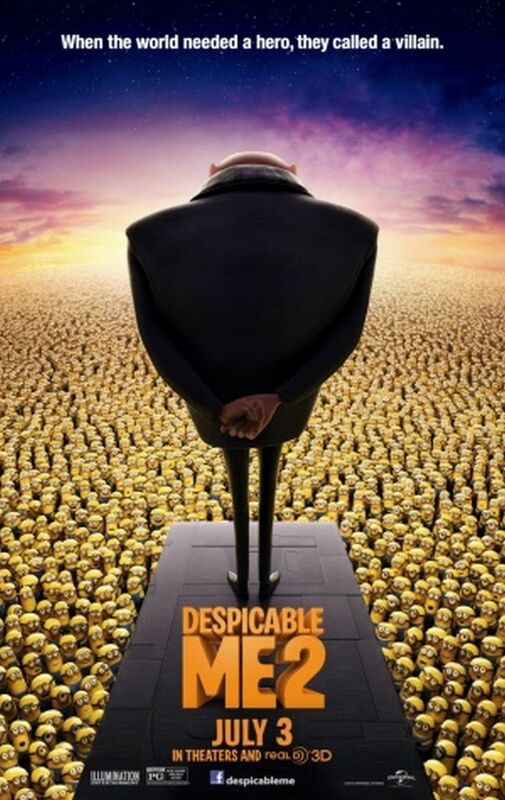 This prequel surpassed expectations plundering almost USD1.16 billion worldwide, ranking it as the 2nd highest grossing animated movie of all time! Cumulatively the 3 movies have earned over USD2.67 billion with an average production budget of only USD73 million per movie. Do the math and that's over 12 times return on investment! 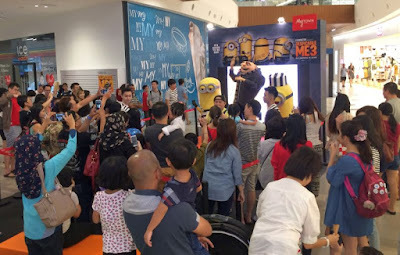 Flashback on our Blog post on The Minions in 2015. 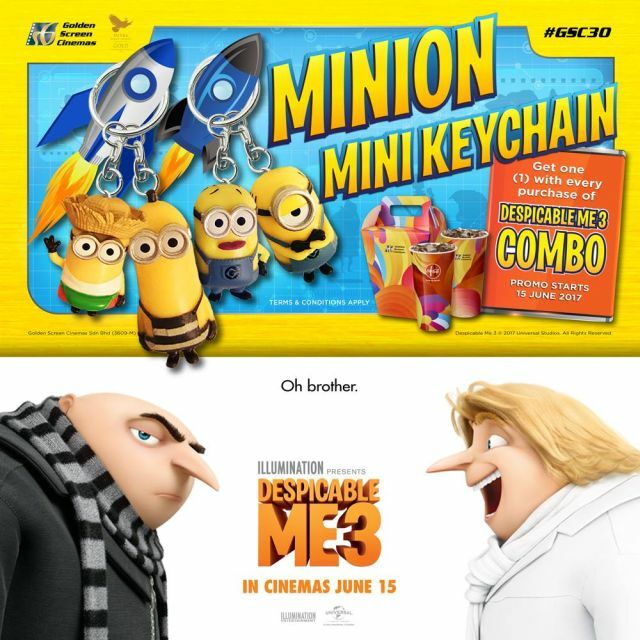 With that much profit that borders being despicable, we now come to the 3rd installment and 4th movie of the franchise, Despicable Me 3. Welcome back Gru and his lovable daughters, Margo, Edith and Agnes, plus of course the Minions aplenty. 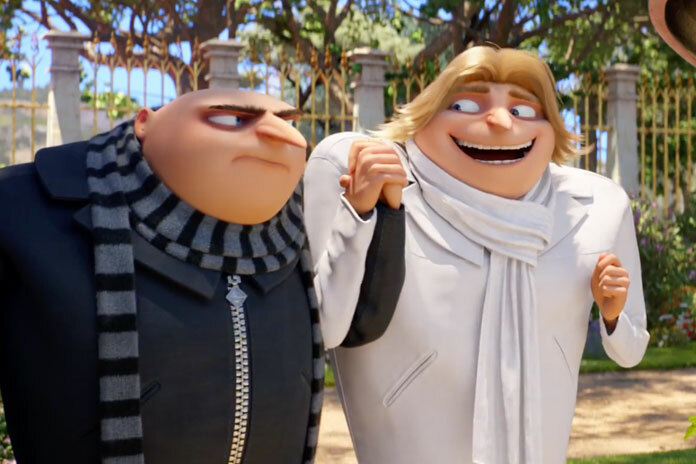 Steve Carell returns as the voice of Gru but also pull double duty this time as the voice of Dru, Gru's long-lost twin brother. "Oh brother" indeed! Despicable Me 3 (2017): Care to guess the box office gross? Gru faces off against Balthazar Bratt, a former child star who has grown up to become obsessed with the character that he played in the '80s, and gets into some sibling rivalry when he meets his long-lost charming, cheerful, and more successful twin brother Dru who wants to team up with him for one last criminal heist to steal the diamond that Bratt has stolen. 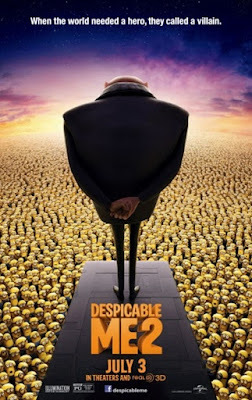 Meanwhile, The Minions rebel against Gru and decide to return to villainy with their new leader, the Minion Mel. Directed by Pierre Coffin and Kyle Balda, co-directed by Eric Guillon and written by Cinco Paul & Ken Daurio, the animated film is produced by Illumination’s Chris Meledandri and Janet Healy, and executive produced by Chris Renaud. From what can be gleamed from the trailer, not much of Balthazar Bratt is shown at all. Instead it focuses on introducing Dru and forthcoming misadventures into villainy by the twin brothers. 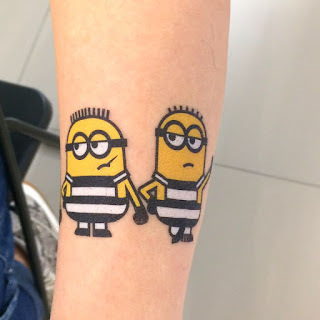 Introduction bad boy Minion Mel. 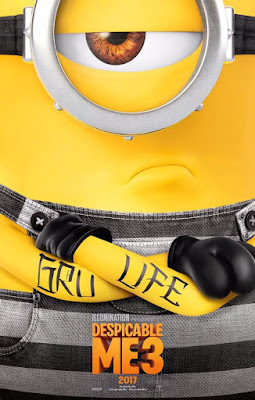 The Minions language is also said to contain words from English, Greek, Spanish and Italian. 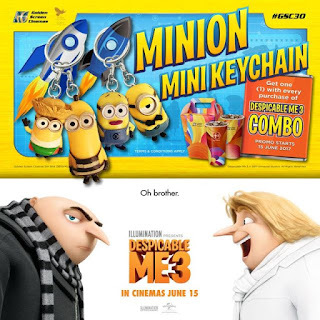 Given the track record of this franchise, Despicable Me 3 looks set to be another huge animation hit. There are no reviews out yet at time of this post but here are 5 reasons given by CinemaOnline. 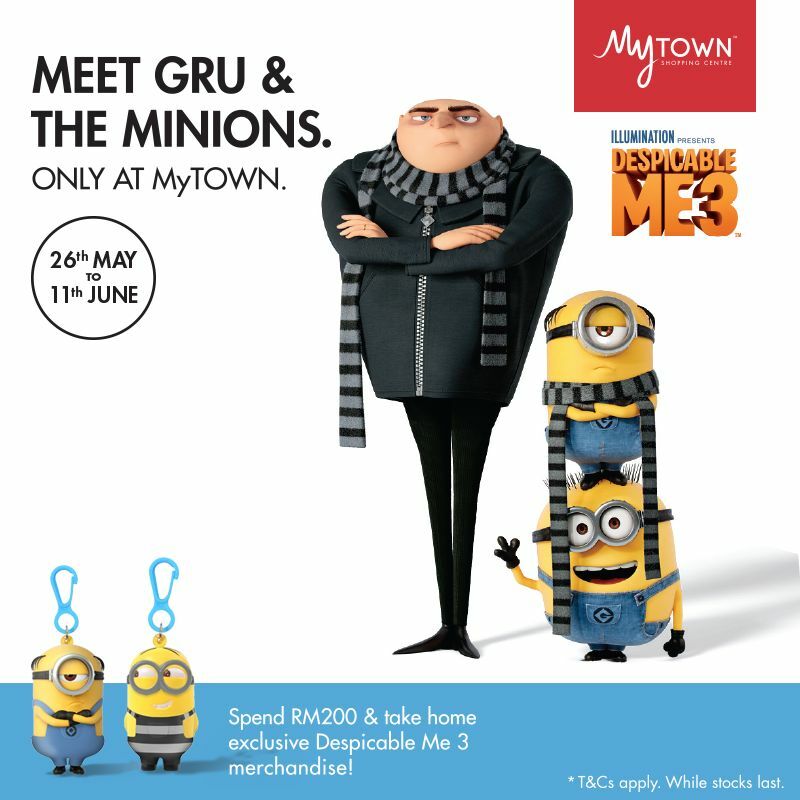 This school holidays, MyTOWN Shopping Centre has teamed up with United International Pictures Malaysia to bring Gru and his Minions LIVE to Malaysian fans! Meet Gru with Minions Kevin (left) and Stuart at MyTown Shopping Centre. 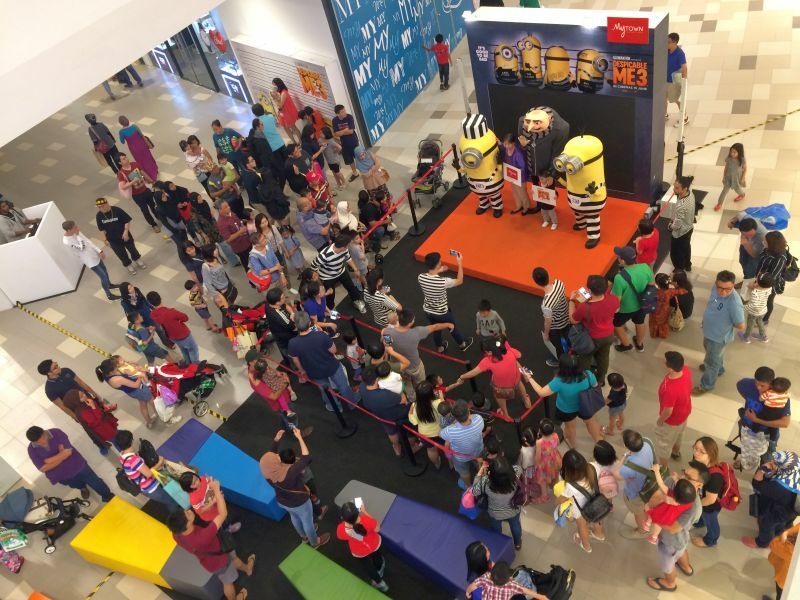 Gru together with Minions Kevin and Stuart will be conducting Meet & Greet with fans everyday at 1pm and 6pm until 12 June, with additional sessions on Fridays, weekends & public holidays at 4pm. Find them at the main atrium ground floor near entrances of Parkson and Uniqlo. 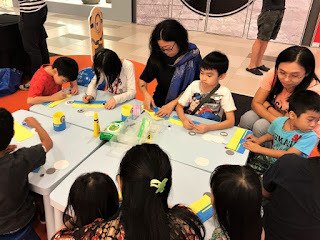 Other family-friendly activities are available during the day. Fans can get free Minion tattoos whilst shoppers spending a minimum of RM200 receive thematic nail art. 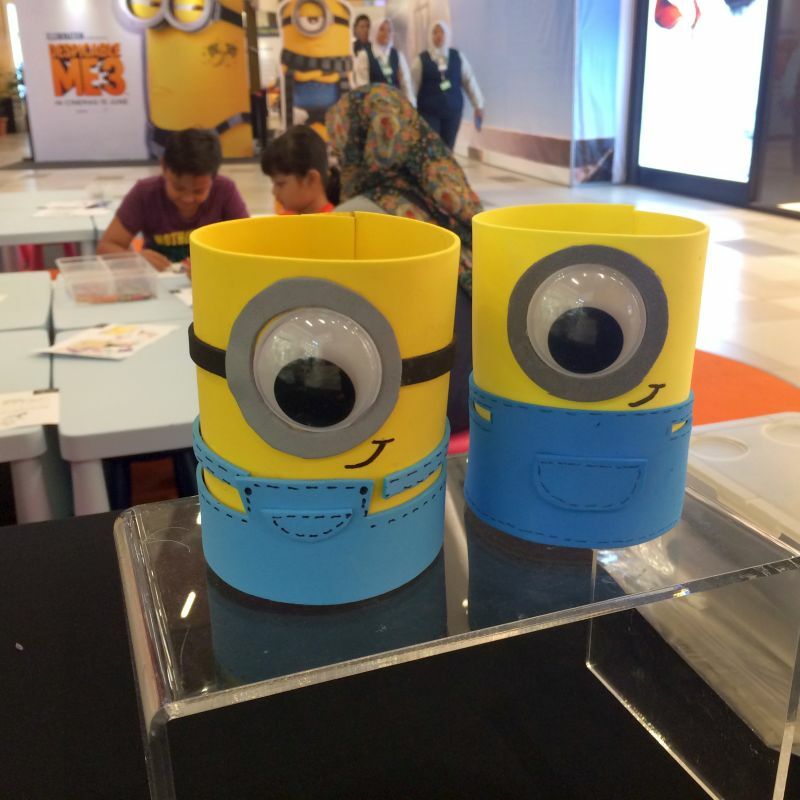 Kids can also join the arts and craft workshops to create Minion goggles, pencil holders and toppers. 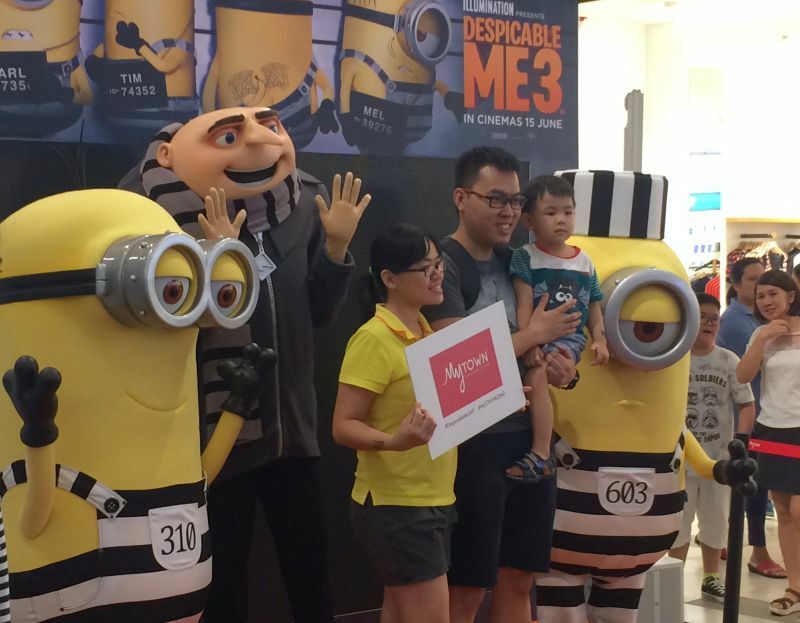 There is also loot to be won from Despicable Family Games leading up to every Meet & Greet session. Crafting Minion accessories. Photo credit: thelevel.my. 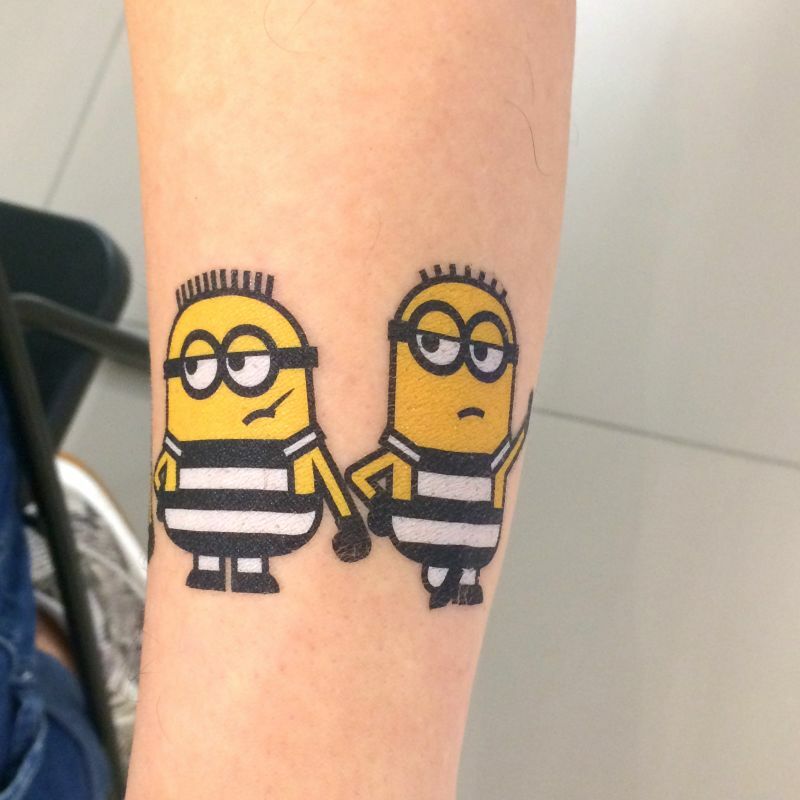 Showing your love of Minions. Find out when these fun activities are happening from the MyTOWN website scheduled until 12 June. 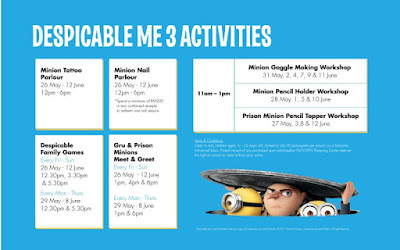 So head on over this weekend for some despicable fun before school starts next week. 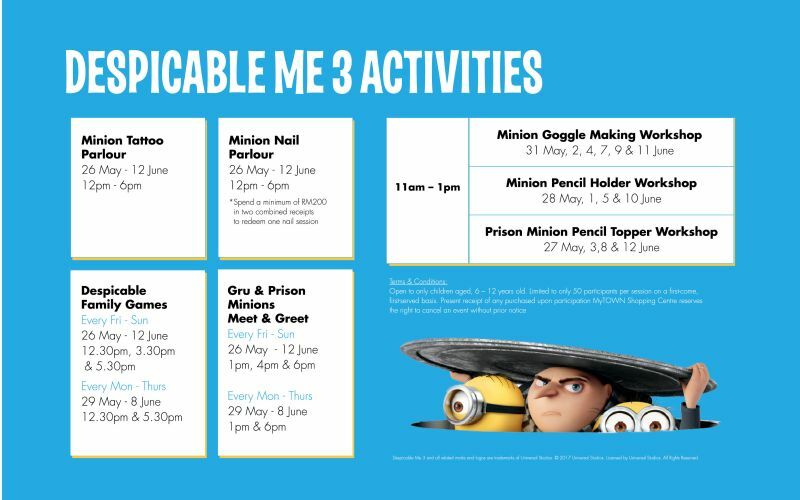 It may even be the last chance to meet Gru and his Minions live before they head to their next adventure! Complimenting the Despicable Me activities are lots of merchandise to take home like toys, clothes or bedding products. 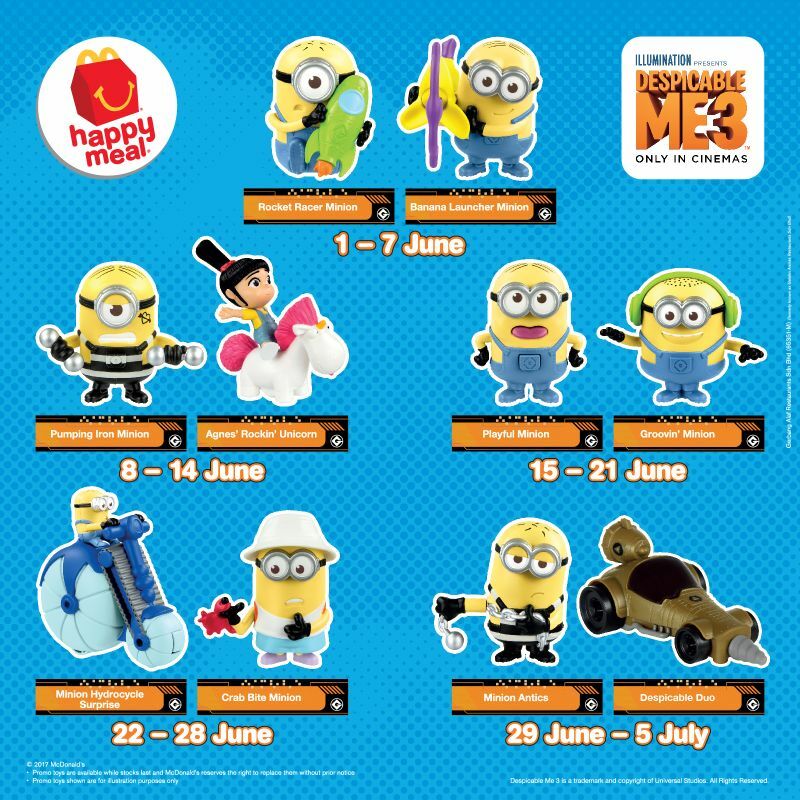 Spend over RM200 here (and at other MyTOWN shops) to redeem a free limited edition Minion mini-squishy on top of free nail art. Take home these squishy Minions when spending over RM200 at MyTOWN. Stay happy when you get your Minion from a Happy Meal. 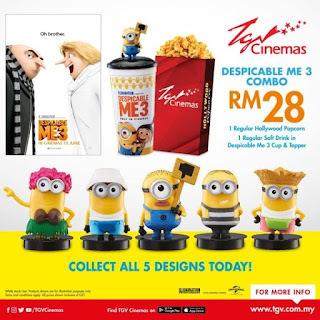 Meanwhile TGV Cinemas is offering the Despicable Me 3 Combo for RM28 comprising a regular popcorn and soft drink in a movie cup with figurine topper. 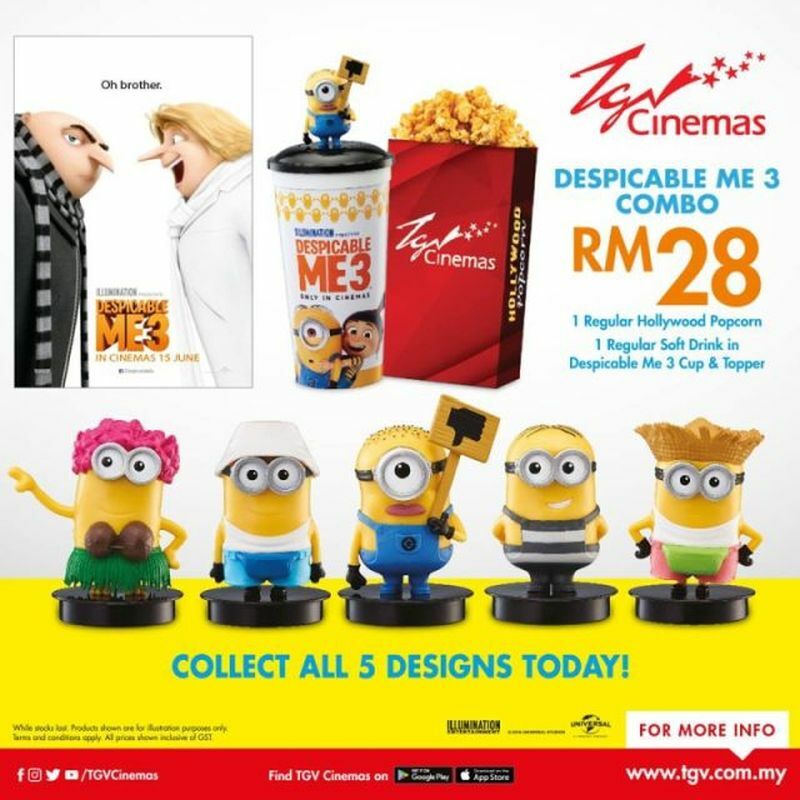 5 designs are available so completist collectors prepare to watch more movies at TGV Cinemas. 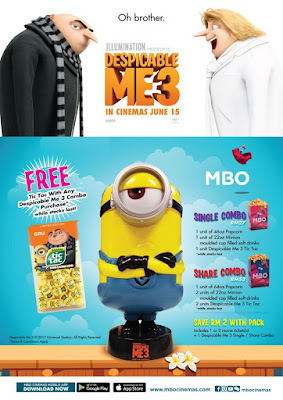 Over at MBO Cinemas, their Despicable Me 3 combos offers molded Minion 22oz cups with popcorn and limited edition Tic Tacs looking like Minions. Plus save RM2 when purchasing combos together with movie tickets. 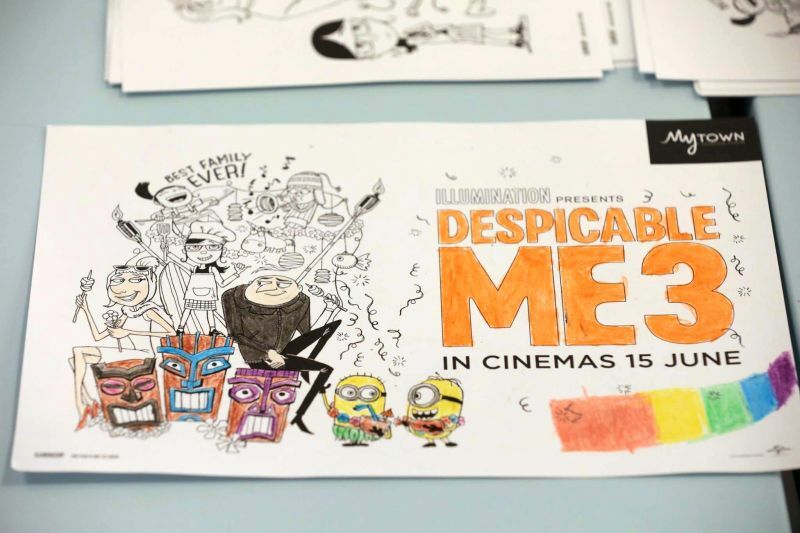 To get an earlier preview of the movie, United International Pictures Malaysia is offering Premiere Screening passes through contests on Facebook and Instagram; find out how to enter from their Note on Facebook. Also try your luck for contest by Hype.my and Hitz.com. To win some official Despicable Me 3 merchandise, join this contest by Nickelodeon Asia. Disclaimer: Despicable Me, Minions and other trademarks are copyright to Illumination Entertainment and Universal Pictures, referenced here for fan service engagements without intent to infringe.